To celebrate the re-release of Heathers, Christian Robshaw spoke with the director and one of the Heathers themselves. Read what they have to say about 30 years of this cult classic. 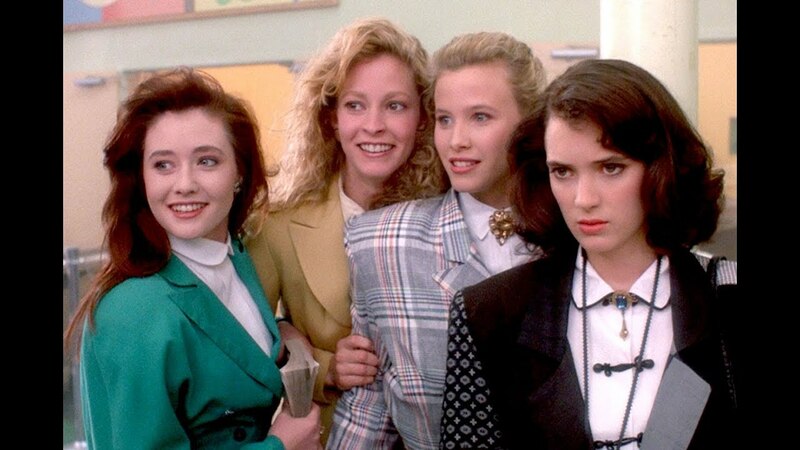 With the new Arrow Video 30th Anniversary rerelease of Heathers, what are your thoughts on the movie at 30? Lisanne Falk: I’ve watched the movie at various points throughout the years, and at times I’ve felt that the fashion might have been dated or some things might not have worked as well today, but I rewatched it a couple of weeks ago ahead of all these interviews and I think I appreciated it more than I ever have – the beauty of the dialogue, the themes, the way the whole thing was put together. ML: I’m really happy that people are still paying attention to the movie, I never would have expected that. It’s really fun just seeing that people still care to look at it. I’d always thought that it might hold up as one of those odd movies that you look at and say, wasn’t it fun that people dressed that way or talked that way, the way I’d look at Rebel Without a Cause or something like that. But the themes of the movie are still alive, and the arena of its discourse – high school – is still alive, and dark humour, if it holds up, is always fun to see. So I guess it holds up enough. I like to think that it does. Heathers has actually achieved something of a cult status. Is that something you ever imagined at the time? LF: Well, you don’t set out to make a cult movie. A cult movie makes itself, right? So why did it become a cult movie? ML: Dan[iel Waters]’s script is pretty amazing, his use of language and, I think, his entire concept is worthy in itself of cult status. Nobody else has really written that way. LF: I didn’t realise until later on that he really just invented that dialogue. That’s not 80s dialogue, which was like “Awesome!”, “That’s rad!”, that valley talk thing which would have dated the movie. ML: Yeah, it is true that the language is fabricated, people never spoke that way. Part of what we worked on making the movie was to make it flow naturally. LF: You mean I didn’t just know how to say it naturally? LF: Because I remember being so amazing that you didn’t even have to direct me! ML: You were always perfect, yes. It’s also quite a shocking film. It was shocking for its day, but how shocking do you think it is now? ML: Well, this whole question of how the movie relates to teen violence is complicated. When Columbine happened, I immediately looked to see if there was any reason to believe that these people had ever watched Heathers, if it was a reference point for them at all. As far as I can tell, it was not on their radar. They were looking at Jim Carroll’s Basketball Diaries, is what they said at the time. ML: Right. I would never want to think that anybody would watch Heathers and be inspired to commit violence. And of course, I would say that the movie doesn’t endorse violence in high school at all. But there is a central character in there who looks to use violent means to get vengeance against the people that he thinks are bad, and that’s part of what happens with these things. So it is complicated. LF: It’s a revenge fantasy, that’s what I think of it as anyway. You know, when you’re being bullied, in high school or at any point in your life, you have these fantasies that you might never vocalise. This is the vocalisation of the ultimate revenge fantasy, come to life. But it’s not reality. LF: Well, love is blind! ML: …but it is a moral journey. So, it’s an interesting question, when people say, “Could you make the movie today?”, well, not exactly as it is, but, you know – Lisanne, you had a great answer for that. LF: Well I said we wouldn’t remake it because it’s already been made! You’d have to come up with something new and more provocative. People talk about Heathers as a film that couldn’t be made today, but with constant talk of a remake, plus the musical and the television series, Heathers actually has more cultural presence than ever. ML: I think that’s partly because the behaviour that the movie depicts, and the issues that it addresses, haven’t gone away. The high school experience for kids has changed in many ways, but it’s also probably pretty much the same. LF: Well I have a teenage daughter, and I’ve asked her and her friends how they view it. What they relate to the most is how it depicts the high school experience, the different cliques, the bullying and friendships and first loves, that’s what they seem to hang onto and find most engaging, not the suicides. A few different endings to Heathers were talked about, what was that process like? ML: Dan wrote an ending in the draft that we took to New World, in which they do blow up the high school, and it ended with prom in Heaven, where everybody is getting along because they were all in Heaven together. But the head of New World Pictures said, “I can’t support a movie in which people who are engaging in murder and faked suicides and then essentially kill themselves are in Heaven” – he felt that it would be irresponsible, were to inspire copycats or anything like that. He felt it was important that the movie reached a certain morally acceptable resolution. Dan and I were not so responsible. LF: I would have thought, that if I’d seen that ending I would have just seen that as a beautiful visual, I wouldn’t have seen it as these people being dead or whatever else. I think it would have been interesting to me, but obviously the more literal, grown-up people have to take these things into account. ML: Dan and I made that argument and many others to try to convince him, believe me. LF: Well, if you don’t get the movie made then nobody will see it, so you do have to make those concessions. ML: I like the ending that we have. I was relieved when we cut the movie together that it basically worked emotionally and was an acceptable ending. I never thought it was a copout but I don’t think it’s as good as what Dan originally wrote, and I think he feels the same way. When we were talking about the iconic fashions of the movie, I was wondering where that look came from. ML: Rudy Dillon, who was the costume designer for the movie, created those costumes. Did you work really closely with Rudy, Lisanne? LF: Yeah, we all went in and tried things on, and she had a bunch of clothes and ideas and sketches, from what I remember. It was an exaggerated version of what was the fashion at the time – shoulderpads were big, but ours were doubly big. And we had all those colours at various points of the film – shades of red, blue, green, yellow. That was something I thought was fun but that was all in the script. ML: Yeah, that was all indicated in the script and was then elaborated on. Jon Hutman, who was the production designer, and Rudy Dillon who did the costumes, worked together really well in figuring out how to implement this colour-coding of the characters and make it work. But it is true that the kind of goofy 80s wardrobe – we knew we were making fun of it at the time. It’s funny now, because people look back and say, “Did people really dress like that?” Well, they did kind of – you know, those were off-the-shelf clothes, but they had been altered. They are strangely timeless in a way that’s not true of Pretty in Pink or Ferris Bueller. LF: You guys are brilliant. How’d you get so smart? How do you know all these things? Heathers is showing at select cinemas now!